Convenient for Mom. Cleanliness for Bub. Made for the modern day mom, who is on-the-go. Our portable diaper changing pad clutch is a must have baby essential to take with you wherever you go, to make sure your baby is clean, dry and safe. Whether your shopping, going for a stroll in the park or having coffee with friends, our versatile pad is easily clipped to your stroller, arm, placed in a bag or held by your side. Diapers, cream and wipes, can call be stored in the generous size inner mesh and zip pockets. At the outer front and back, there's zip pockets for moms phone, cards and cash - Everything you need for day trips with your baby. What a great alternative to lugging around a huge diaper bag all day. Our changing pads head area has 15mm of cushioning, which consists of the standard 10mm padding through out the pad, plus an extra 5mm pillow. Now Mom can relax knowing her baby's delicate area will be safe. 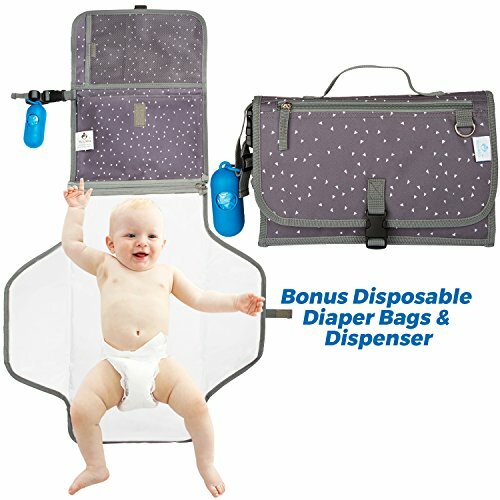 If there's no trash cans near by for your dirty diapers, simply grab your bonus dispenser with disposable bags, pull out a disposable bag and add your dirty diaper. Now you can make sure your baby and possessions are kept clean until you find a trash can to throw it away. When Mom is done changing bub, the easy-clean waterproof pad makes wiping clean a breeze. It's practical, stylish, convenient and most importantly comfortable for your little angel. As an extra special surprise for our awesome customers, we're giving you our new ebook "What to expect in the first 60 days". A great book for new moms to help prepare themselves for the exciting times ahead. BUY WITH CONFIDENCE - The Koukla Promise will give you peace of mind. If you're not 100% satisfied with your purchase we offer a full refund with our Koukla manufacturer's warranty. Buy now to make your parenting life, a little more convenient. A MUST HAVE FOR THE ON-THE-GO MOM - Our diaper changing pad is convenient to take with you wherever your day takes you, so you can change bub on something thats clean, safe and hygienic. CUSHION FOR YOUR BABY'S HEAD - We've added an extra pillow at the head zone of our changing pad to cushion your baby's delicate head area. One less thing Mom has to worry about at change time. EASILY DISPOSE OF DIRTY DIAPERS - Our dispenser with disposable bags solves the issue of where to put the dirty diaper when a trash can isn't around. Bag up the diaper and move on with your day. PLENTY OF SPACE FOR BUB & MOM ESSENTIALS - Inner zip and mesh pocket for diapers, wipes & cream, plus two zip pockets on the outside for all mum's essentials, makes this the ultimate diaper clutch. EASY PEASY CLEANING - The inner pad is waterproof and can be removed from the clutch by undoing the connecting zipper, which makes cleaning up your baby's mess as easy as 1-2-3. If you have any questions about this product by Koukla, contact us by completing and submitting the form below. If you are looking for a specif part number, please include it with your message.